Welcome to the Monroe County Collector homepage. 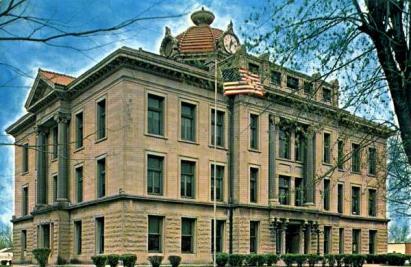 We, at the Monroe County Collector's office, strive to provide the best service to the taxpayers of Monroe County. In saying such, we hope that this site assists you with the necessary information for us to provide the services. As your Monroe County Collector, Chrissy Graupman, I would personally like to welcome you to this website. Chrissy Graupman, Monroe County Collector, was elected as county collector in 2018 and took office in March 2019. Chrissy has one full-time deputy, Jackie Sutton, and one part-time deputy, Linda Hogan, who works from November through mid January. The Monroe County Collector of Revenue is the elected official who is responsible for the collection of current and delinquent property taxes for the county and various political subdivisions within the county, which have authorized property tax levies. The collector must use any legal means to collect delinquent taxes. The Collector is responsible for the accounting and distribution of collection for tax entities such as schools, roads, cities, library and fire districts. The collector also collects merchant license fees. Tax records are maintained and held for public use within the collector's office. Real estate and personal property tax are levied anually and due December 31st each year. The postmark determines the timeliness of payment. The Collector's office mails tax bills during November of each year. If a tax bill is not received by the second week in December, contact the collector's office at (660) 327-4320. Failure to receive a tax bill does NOT relieve the obligation to pay taxes and the applicable late fees. Taxes not paid in full on or before December 31st will accrue penalties, which can be as high as 25% during the first year of delinquency. There is a gray drop box located at the south door of the Monroe County Courthouse to allow taxpayers the convenience of paying their taxes after hours and a paid receipt will be mailed to them. Payment may be made either online or in the office with cash, personal check or money order. Duplicate paid tax receipts are available from the collector for $1.00 each and may be obtained in person or by mail. Monday thru Friday, 8:00am til 4:30pm. The Monroe County Collector's office observes state holidays.